When you think every WWII story has been told, an original narrative comes along and you realize there’s a plethora of war stories remaining to be explored and shared. Abstract expressionist art, French refugees and the WPA collide in this riveting historical fiction novel that focuses on the sudden disappearance of young Jewish-American artist Alizée Benoit. Post-depression and pre-war, Alizée works alongside Lee Krasner on murals for government-funded WPA. The Works Progress Administration], established as part of the New Deal, hired the unemployed for public works projects and hired artists, writers and actors to develop arts, media and literacy projects]. Alizée vanishes amidst personal and political turmoil. Author B.A. Shapiro drops this fictional character in among real historical figures such as Krasner, Jackson Pollock, Mark Rothko and William de Kooning, well-known abstract artists in the 40s. This only works when you believe that the fictional character could have truly existed and with the outstanding depiction and details. Readers become involved in Alizée’s story and in her quest to expose the truth about the war and save her family from impending atrocities the Nazi Party will commit in France [Alizée’s family lives in France] before the United States became involved in the great war. While she falls into an affair with Mark Rothko she remains focused on her art as well as helping refugees flee Europe while the Nazis begin to evoke terror. By day she works for the government-funded WPA and in her free-time Alizée remains part of the counter-culture. She meets Eleanor Roosevelt [“Mrs. Roosevelt was a moving force behind the WPA/FAP, and every artist on the floor revered her for that] who purchases several paintings and becomes quite impressed with Alizée’s talent and desire to use her art to convey messages. She belongs to a communist anti-war group, Americans for No Limits. Alizée saves all her money to purchase visas for her family to leave France. She’s met with many roadblocks. Shapiro notes that there’s a young congressman (Lyndon Johnson) secretly transporting refugees to Texas. Unfortunately he’s not focusing on France at that time. This clash of ideals makes Alizée a target and puts her into increasingly dangerous situations. President Roosevelt didn’t want the United States to become engaged in the war and to that end didn’t seem interested in assisting political (Jewish) refugees either. Honestly not that different from the United States willingness to bring Syrian refugees here. Alizée makes enemies with Eleanor Roosevelt’s isolationist enemies– Joseph Kennedy, Charles Lindbergh and Breckinridge Long. In present day, Alizée’s great-niece Danielle Abrams works as a cataloger at Christie’s auction house. She gave up her plans to become an artist years ago. Instead she works to research and authenticate remarkable art for auction. Danielle discovers paintings hidden on the backs of potential masterpieces by Pollock, Rothko and Krasner which she believes might belong to her great-aunt. So begins a mystery which forces Danielle to follow her great-aunt’s tracks even traveling to France. Her family, particular her grandfather and Alizée’s brother, never revealed that much about Alizée who disappeared and devastated her brother prior to the war. Although he eventually made it to the United States, Henri never found out what happened to his sister. Alizée is independent, brave, determined and talented. Much like her aunt, Danielle is a strong, outspoken and a confident woman. From page one I became engulfed in both Alizée’s and Danielle’s stories and how their lives intertwined. I learned many aspects about this time period of which I’d been unaware. This is a must-read for fall. It’s the November 2015 Indie Next #1 Great Read. B.A. Shapiro will be at Brookline Booksmith on Tuesday, November 3 at 7pm and Concord Bookshop on Thursday, November 5 at 7pm. The Art Forger by B.A. Shapiro Publisher: Algonquin Books (October 2012). Literary fiction. Hardcover. 304 pages. ISBN: 978-1-61620-132-6. I’d yet to visit the Isabella Stewart Gardner Museum when one of the most notorious and major unsolved art heists occurred in 1990. I’d transferred to Simmons College as a junior that year. Such a devastating loss of thirteen pieces of art worth over $500 million dollars including works by Vermeer and Edgar Degas. I’ve since become a fan of both the museum and the fascinating and venerable Isabella Stewart Gardner– even wrote a children’s book (still unpublished) about her. 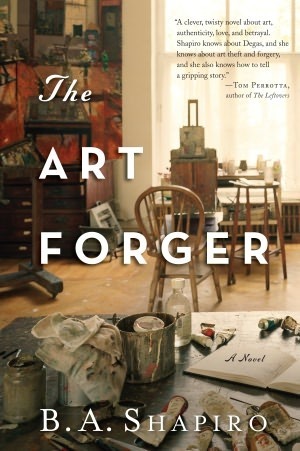 This novel, The Art Forger, focusing on the heist, immediately caught my attention. Claire Roth graduated from the MFA School under a scandalous cloud. She makes a tenuous deal with an art gallery owner to forge an Edgar Degas painting in exchange for her own show in his gallery. The painting he brings her appears to be one of those stolen from the Gardner museum. Claire’s so young and I couldn’t understand her supposed talent as an artist rather wasted at a reproduction company. Scandal or not. I’ve never cared all that much for painted reproductions. I don’t see the point. I didn’t care for Claire or for Marcus, the gallery owner. I also found the entire forging concept a bit sketchy. Shapiro did scrupulous research into forging paintings and provided that detail into The Art Forger. Fascinating and creepy. The fabricated relationship Shapiro created in letters between Gardner and her “niece” never resonated with me or seemed that relevant. I found the letters inauthentic in tone. The pages teem with flat characters but ooze with paint. The art propels the story. To be honest, I almost stopped reading this novel about one hundred pages in. But I decided to give it another go and the novel redeemed itself somewhat in the end. 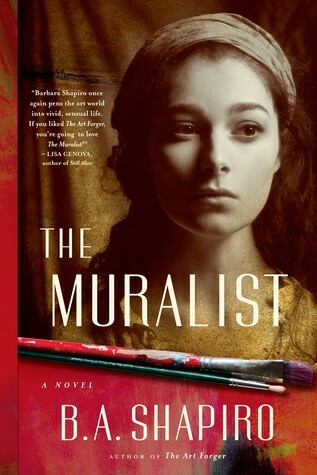 At a recent book reading, Shapiro said she greatly admired Gardner but I found the novel undermined her a bit and I’m not sure Gardner would’ve had a forged painting on her walls. She was way too savvy for that. FTC Disclosure: I received this book for review from the publisher.